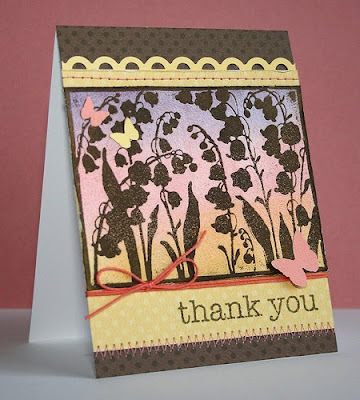 SUE had a great post on her blog today......she showed her top favorite cards from the Hero Arts Flickr group. I thought this was a great idea! So get your favorite beverage and get comfortable and let's take a walk down memory lane. It was so difficult to narrow down this list. Many of my favorites are missing because I couldn't figure out how to get their pictures posted here. Keep in mind that these are my favorites today; tomorrow they'll be different! I am so proud to be part of this amazing group of women! Thanks, ladies, for the constant inspiration! I could choose 20 of Jacqueline's cards to show you, but this one really touched my heart in so many ways. She stamped over a photograph of wooden shoes planted with pansies. I love OZ's cards because they always show her sense of fun and they are always beautifully crafted. 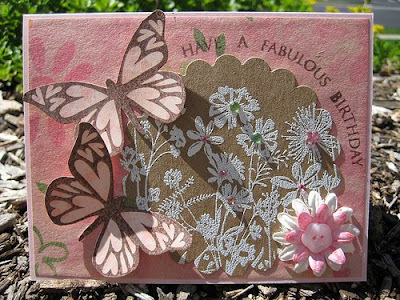 Tif's cards are always like a fairy tale brought to life; she often uses beautiful flowers. Every single one of Donna's cards are a work of art. 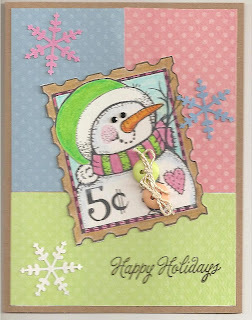 This one is one of my favorites from the shaped cards challenge. 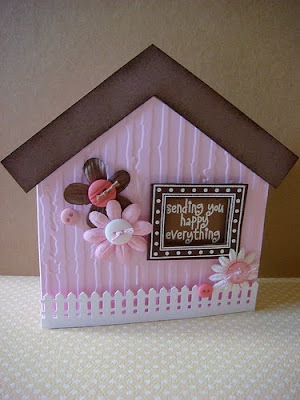 She even has a white picket fence! 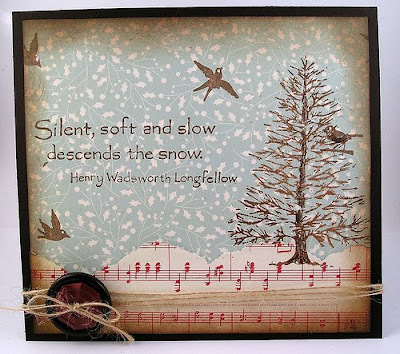 Suzanne's card perfectly exemplifies the peace and gentleness that winter can be, and it incorporates music paper. 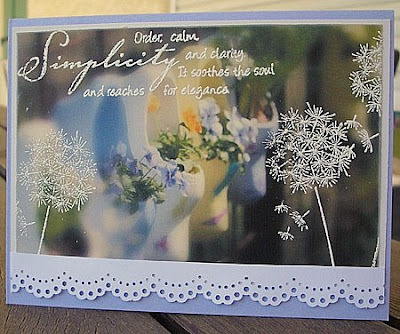 Marilyn's card is one of my very favorites, and I've used it as a model many times for cards of my own. 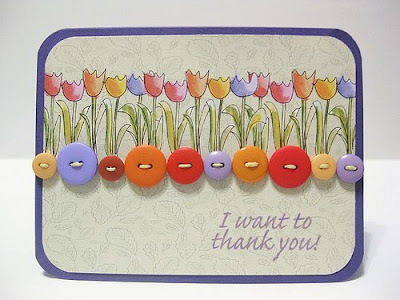 This one of Laura's is pure joy to me; it uses a digital image of one of my first Hero stamps, Sketch Tulips. 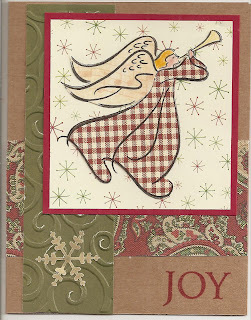 This card of Kathy's is another one of my all-time favorites; so much so that I did my own version of it. 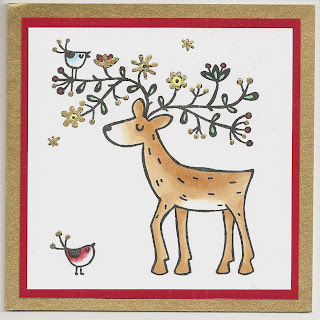 This card of Sue's is one of the ones that makes me want to drop everything and run out and buy the stamp that is featured. My Hero Hostess Sista Cathy made this little lovely for the photo challenge, and I can almost smell the lavender! Trace has her own unique style. This one is one of her earliest cards; it makes me think of a soft worn quilt. And this one of hers is my model for when I need a masculine card. This card by Kathy Rosecrans hits all the right notes for me: text, scallops, gingham, flowers.....just a beautiful design. 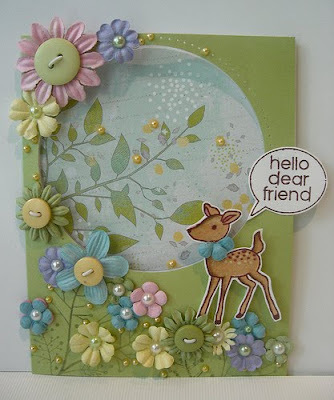 Here is a gorgeous card by another of my Hero sisters, Sarah. 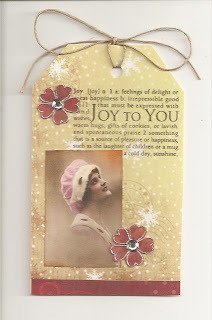 This was just done for the recent blog hop. She used my current favorite stamp and made it sing! Daria's card is another of my very favorites. The design is so appealing to me, and it uses everyone's favorite Heart Winged Butterfly. Finally, I think Robin and I were separated at birth :) She and I seem to have the same sensibilities. Here is one of my recent favorites of hers; it has everything I need: pink, brown, hearts and flowers. Please click on each artist's name to take you to her Flickr photostream, where you will learn more about each card, and can then explore more of her cards in her stream if you'd like. 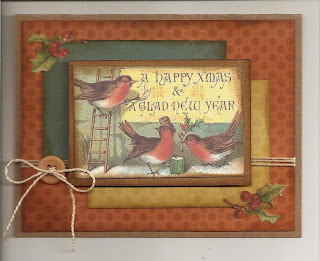 It's almost the New Year here, so I'll close for tonight, but will be back tomorrow to post another of Sue's ideas, a look at my favorites of my own cards from before this blog was born. Happy New Year, everybody!! Playing with more new Hero Arts stamps, this one a clear set called Big and Small Flowers. The flower was stamped in 2 hues of each color, cut out, snipping the petals separately, then ruffling them before stacking them using thicker pop dots. Supplies: Hero Arts stamps CL374 Big and Small Flowers, CG130 Butterflies Images cling, K&Company Brenda Walton Dollhouse Peach Gingham paper, orange, salmon, yellow, green cardstocks, yellow card. Here I stamped 2 sizes of the flower in light and darker pink and yellow cardstock, cut them out and layered them. 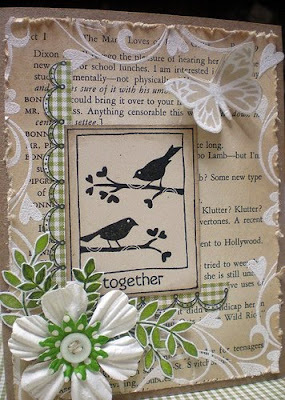 Used this pretty sentiment as a stem, and mounted everything on a green card stamped with the branch background. Here I did not pop-dot between layers, just glued the 4 layers together. Here's another new Hero Arts clear set of stamps called Speckled Ornaments. 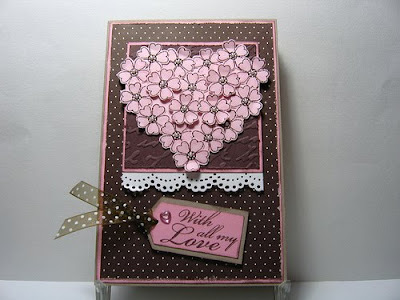 I loved what Jenn did for the blog hop stamping it in brown on pink for the top of a bag of candy hearts. 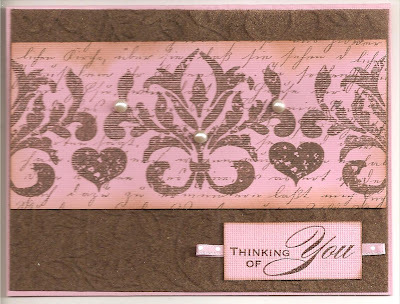 I added Old Letter Writing to the background, and used the fleur-de-lis and the heart from this new set. My brown background is a piece of self-stick velvet paper run through the Victoria Cuttlebug embossing folder. This time I started with a piece of blue polished stone from my scrap basket, and stamped the Silhouette Bells on it in VersaMark, then heat embossed it in white. I colored the leaves and stems in with a green marker. 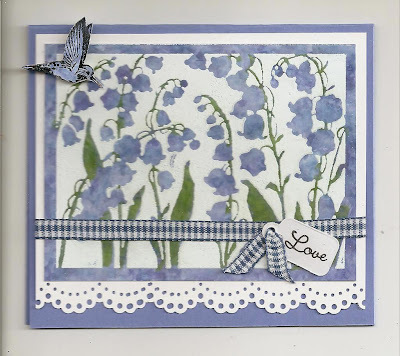 Then I layered this onto a piece of white cardstock that I had punched with a Martha Steward doily lace punch, adding the gingham ribbon and a tiny tag for the sentiment, and pop-dotting a hummingbird stamped on the same blue polished stone background. Then everything was centered on a blue card. I've been so looking forward to playing with this new Hero Arts Silhouette Bells stamp! Here is the first stamping. I was heavily influenced by Suzanne's experiments here. Ho Ho Ho, little elf! Just a share of our smallest elf this year, about 8 months old!! Isn't he precious? Merry Christmas, everyone, and Happy New Year!! Thanks so much for visiting my blog; if I'd known how much fun it was going to be, I'd have started one a lot sooner. I so appreciate all your comments and support. 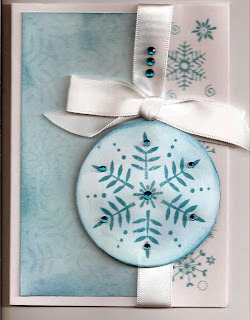 For the Embellish Snowflakes color challenge to use kraft, dark brown, aqua and lemon yellow, plus snowflakes. For the brown, I used Memories Artprint Brown ink on the butterfly and the sentiment. 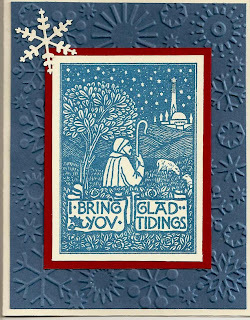 Hard to see, but the kraft is stamped with smaller snowflakes in a pale aqua ink. Supplies: kraft, yellow cardstock, aqua marbled printed paper (for butterfly and strip), various snowflake punches, HeroArts clear stamps CL234 Winter's Butterfly, F5158 Heart Winged Butterfly, a la Mode aqua glitter, Martha Stewart Doily Punch, Memories Artprint Brown, Colorbox aqua ink, Hero SparkleGems in yellow. Welcome to the Hero Arts BLOG HOP!! I am so excited and honored to have been asked to be a guest! If you’re following along in order, you’ll have arrived here from Kelly Rasmussen’s blog. If any of the links are broken, or you have just happened to come across me out of the blue, go to the Hero Arts Blog to see the list of blogs participating, so that you don’t miss any of the new 2010 catalog stamps being unveiled today!! 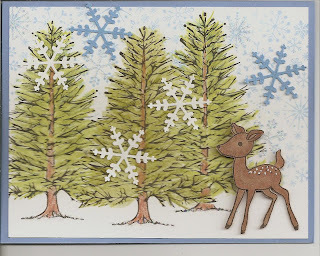 I’ve made 3 cards for you today using some of the brand NEW 2010 stamps. 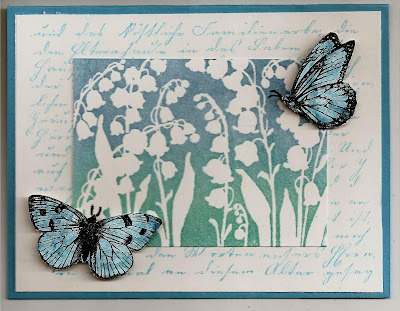 My first card showcases the beautiful wood stamp called Silhouette Meadow Flowers. It was stamped on ivory music paper in black ink, then framed in black cardstock. This was set onto an ivory parchment card, adding the black dotted ribbon and flower and then the sentiment, which is raised above the card with pop dots. When I saw the What’s Perking clear set, I envisioned a china cupboard with coffee mugs hanging from lace-lined shelves. I chose the flowered mug and colored it with Prismacolor pencils in variations of blue, yellow and white, then cut them out and hung them from my shelves, finishing off with the sentiment from the same set. The clear Antique Engravings set is beautiful, filled with these six winged creatures, plus two little hummingbirds, a ladybug, and three seashells! I randomly stamped all of the butterflies and the dragonfly on white card stock, heat embossed them in white, then rubbed on a rainbow of hues using Distress Inks. Then I stamped the largest butterfly in black on gold, blue, pink and green cardstock, cut them out and layered them, adding pearls for the body. Yes, that butterfly is the same one that we’ve been seeing in the digital Flutterbies set! I thought this sentiment from the clear Essential Messages set was perfect for this card; it was framed using the same four colors of cardstock. Thanks so much for visiting; I love reading your comments. 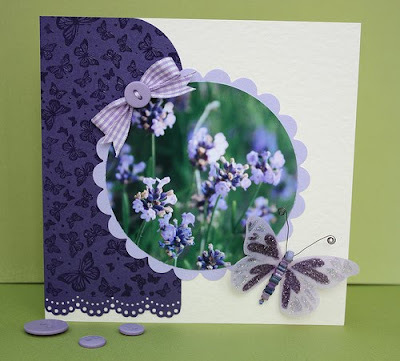 Now move on to Claudine Hellmuth's blog to see what she's created for you! Happy Hopping! Remember, if you find a link that doesn't work, you can always hop back to the Hero Arts Blog for a list of direct links to all the blogs in the hop! 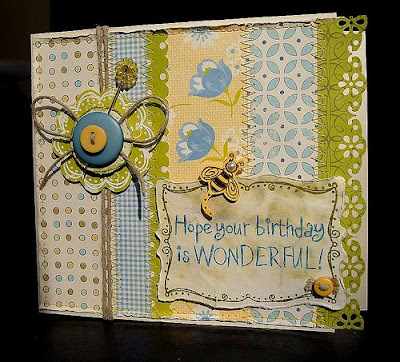 Here is a card I'm entering into the All Creatures Great and Small Challenge at Moxie Fab World. We were to "make a holiday project that includes some kind of critter." Just sharing another Christmas card......you've seen it before, but here I made it a little more country, using gingham paper to paper-piece her dress and kraft for the card. It was pure coincidence that one of the stars behind her head appears to be a halo. Hero Arts sponsored an ATC swap recently, and I was lucky enough to be included in 2 groups. I am amazed at the beautiful work that is done in miniature......these little treasures are 2.5 X 3.5 inches!! I decided for the holidays to display them on this little tree; they go all around, and this is just a sampling of one side of it. If you'd like to see them all much closer, go to Deborah's blog here and here. Deborah did a fine job photographing them! This is probably my favorite stamp this season; I've used it for many Christmas cards. Here it is just stamped and heat embossed in white, framed, and placed on a snowflake-embossed background which has been sanded to bring out the detail. I added just simple embellishments, a pale pink pearl heart at the top and a pink lace heart from my friend Linda at the bottom. 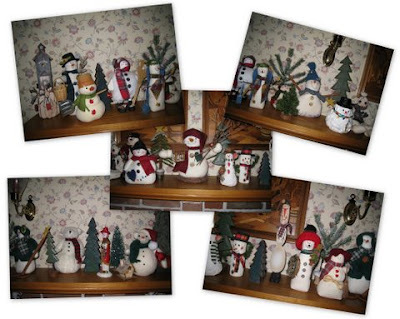 And here is a picture of some of my snowmen collected over the years. Thought I'd share one of my little quilts, made to be hung on the wall. This one lives above a fireplace at this time of year, surrounded by my collection of snowmen along the mantel. It is about 34 inches square, composed of lots of different squares and triangles of various red and green cotton fabrics. There are little red heart buttons to simulate berries, and 5 feather wreaths quilted into the background. Look what came in the mail the last couple days!! This one's from Sarah Moerman. I love her ghost stamping on the blue panel! And doesn't this match my blog background perfectly? And this is from Nancy Krueger. 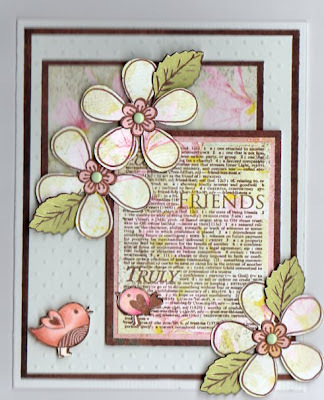 Look closely at all the layers of stamping! Click on the pictures to get a closer look. I am so blessed to have met so many wonderul creative women through the Hero Blog!! 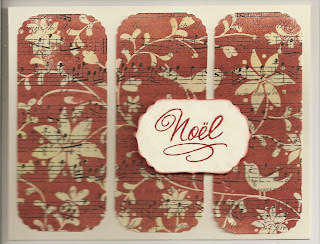 An easy card made by stamping and clear embossing Hero's Poinsetta and Birds Designblock stamp over music paper, then rubbing on Fired Brick distress ink. That was cut into 3 equal panels, rounding the corners with a corner punch, and mounted on a cream notecard. The sentiment is from the clear set Hand Drawn Christmas. 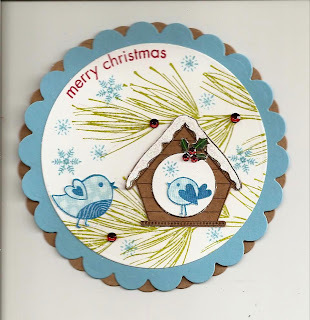 A little circle card that can be used as a tag or an ornament. All stamps Hero Arts. For details, see my Flickr gallery. This card was made for the digital challenge at Caardvarks. The image from Hero Arts was sized smaller, printed in black and white and then colored with Prismacolor pencils. I added some buttons, black gems for his eyes, and placed it over some BoBunny and Bazzill dotted papers on a kraft notecard. Then I punched some coordinating snowflakes. The image can be found at Two Peas. For the Caardvark's challenge to use digital elements. The background papers were a gift from Susan. Robin image and holly sprigs are digital. I wanted to share the card that came today from my Hostess sister Cathy Andronicou.....is this not cute? I love getting mail!! 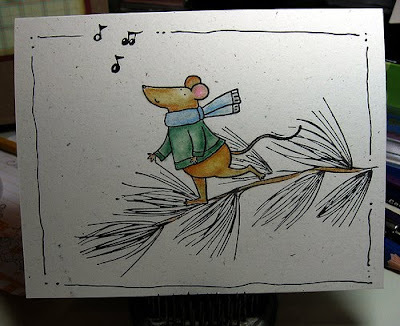 And this one is from my friend Jacqueline in France; she is doing tags this year instead of cards. Isn't this lovely? It's high time I posted a card that really reflects the reason for the season! 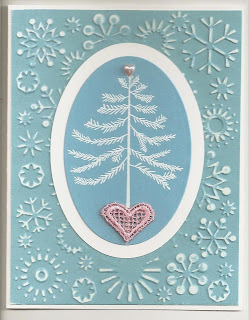 This is a Silver Crow Creations stamp, stamped on cream cardstock in VersaFine Deep Lagoon, then framed in red and mounted on a cuttlebug snowflake-embossed blue cardstock. I added a punched snowflake to give a star effect. My inside sentiment is "rejoice". 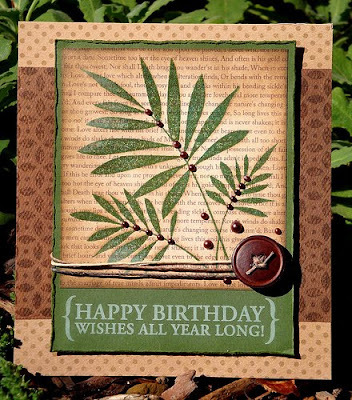 The challenge at Caardvark's is to make a card incorporating a digital element. I found this beautiful angel image at The Graphics Fairy. That's where the holly sprigs are also. 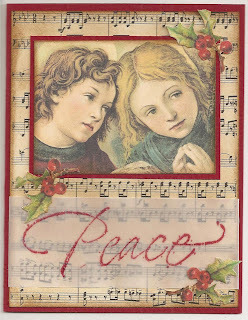 I simply printed out the images, sponged them and the music background with Distress Vintage Photo ink, and assembled the card, adding the peace sentiment stamped on a vellum strip. 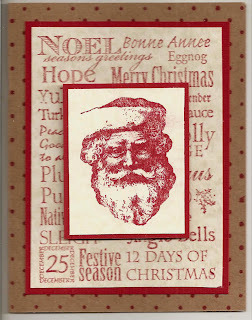 In honor of St. Nicholas Day, here is a card using a beautiful image, that Jacqueline sent me, of Father Christmas. We lived in Luxembourg in 1979, and I remember their St. Nicholas Day celebration. He had a sidekick, Black Peter, who carries sticks for the naughty children. 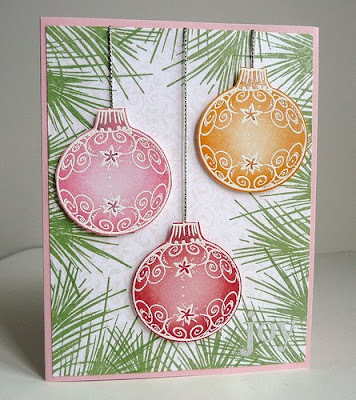 It seems so funny to be showing roses in December, but this card is to enter the Flourishes Floral Finesse challenge. I have so many favorite flowers: lilacs, lilies of the valley, forget-me-nots, daisies. But yellow roses have a special place in my heart; they always remind me of my Grandfather's Peace Roses, and they were in my bridal bouquet. This card is much simpler than my last entry. I simply stamped Hero's Garden Roses on glossy photo paper, watercolored them with markers, framed with lavendar card stock and again with a cuttlebug-embossed Textile pattern on yellow cardstock, then mounted the whole thing on a white notecard. 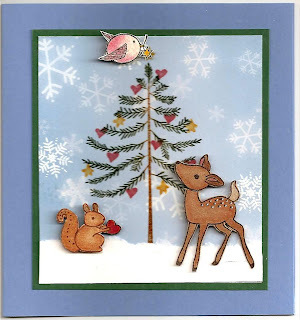 Made with a Hero Arts collage Christmas stamp. 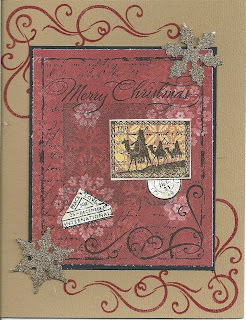 Stamped on a deep red printed paper, a collage in itself, then restamped on several other printed papers, cutting out various elements and gluing them back on the main image. Framed in black, added dull gold-glittered snowflakes, and mounted on a tan notecard with added swirls at the corners. 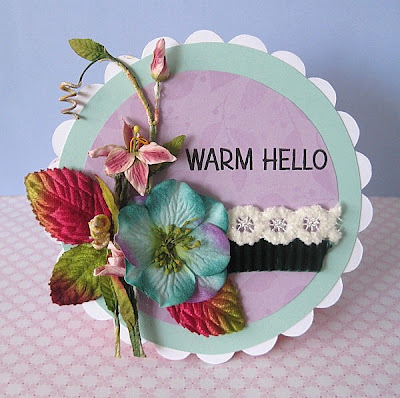 Card made for the Flourishes Floral Finesse Challenge. We are to use a favorite flower as the inspiration for our card or color scheme. 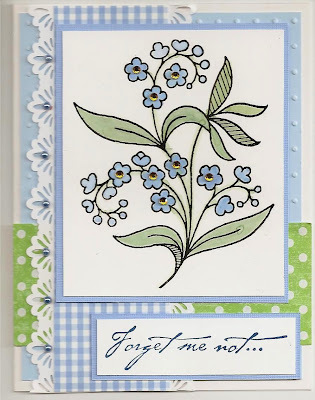 This Hero Arts Sweet Fleur stamp has always looked to me like a Forget-me-not, so I ran with that idea, using blues and greens. It is stamped on glossy photo paper, then watercolored using markers. 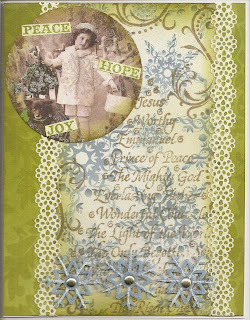 The sentiment is a Paper Inspirations stamp. I added little blue pearls along the punched lace edge, and gold gems in the centers of the flowers. I made this one a while ago, playing with some new Hero Arts stamps for me at the time. I adore this little deer, and had hoped for some pretty trees to pair him with, and Hero delivered! For details, see my Flickr photostream. I was just hoping to give the feeling of a peaceful winter morning in the woods.